Submitted by admin on Tue, 01/13/2009 - 11:18. During the 2008 planting season we started our first ever Welsh truffle plantation. At just over 5Ha, the site is a good-sized commercial plantation and was planted primarily with a mix of Oak and Hazel trees inoculated with summer truffle. However, we also planted a small area with winter truffle on the back of some excellent results from a trial winter-truffle plantation in Devon started in 2006. Out of all our truffle plantations worldwide, this was the first site to be planted without any form of weed control. After 9 months from planting the owner got in contact to let us know that 'burnt' areas had appeared around the base of some of the trees- and so we visited to look closer. Astonishingly, the burnt areas were indeed ‘brules’. A brule is a burnt-looking patch of ground, devoid of vegetation underneath the tree caused by the truffle fungus- these normally appear later in the trees development (typically years 3-7 from planting) and signal imminent onset of fruiting. This is particularly exciting as the trees were only planted 9 months prior. The brules first appeared on the Hazel trees, but by 12 months from planting (late 2008) the oaks were also starting to form brules and this was evident on 70-80% of the trees. We've posted a picture of a brule below. 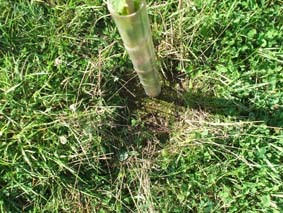 For such small trees the development is amazing and we'll be following the growth of the fungus very closely. We’re collecting data and our truffle-growing partners are benefiting from what we are learning from this site.